What would Halloween be without a Lush haul?! 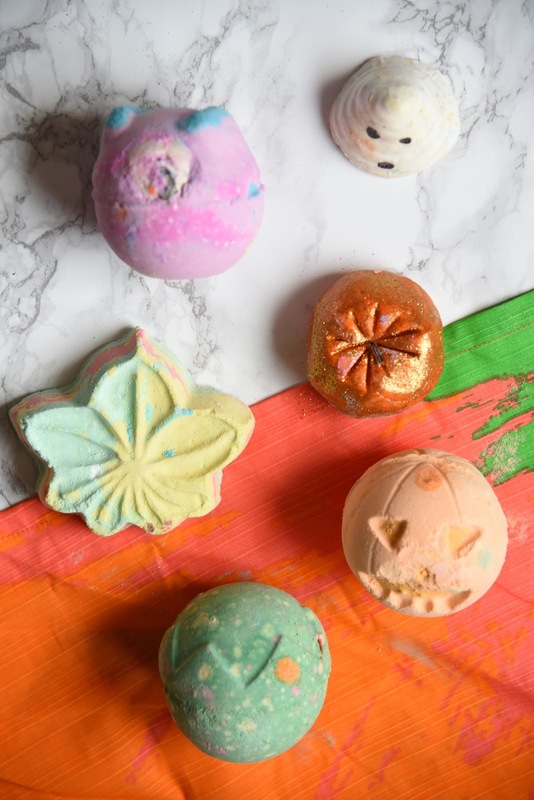 I might dabble with Lush during Easter to pick up a bunch of carrots or a humpty dumpty, but Autumn/Winter is where Lush really livens up! I thought I'd share with you the bits and pieces that caught my eye and I decided to pick up! I actually decided to pick up the Pumpkin Gift Set (£20.95) as I wanted all the things that were in there anyway, and it came with a cute little pumpkin knot wrap. So in the set was, Sparkly Pumpkin Bubble Bar this one is a classic, so so nice, but so messy! Pumpkin Bath Bomb, this fella is super cute and smells like home baking cinnamon goodness! Boo Bath Melt, made with ginger and cocoa butter, this guy will make your skin so soft! Finally Lord of Misrule Bath Bomb, another classic, this one is spicy and full of amazing colour! Alongside the pumpkin I also picked up Autumn Leaf Bath Bomb (£3.75), I love the look of this one, and it smells like crisp leaves! Finally Monsters Ball Bath Bomb (£4.25), mine is a little bit battered as he was the last little man left! But he's still super cute!